The Resource RFB4E Series floor box for concrete floors, including bare concrete and terrazzo, is available for on-grade and above-grade construction and is fully adjustable before and after the concrete pour. Accepts 6-inch round Evolution Series Poke-Thru covers available in three styles and five colors. 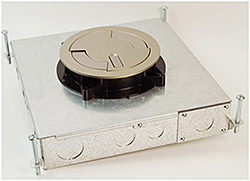 A proprietary conduit hub accepts 2-inch conduit to bring more cables into the 4-inch deep box.